American theatrical manager; born at Berlin May 8, 1848, where he was educated. In March, 1863, he emigrated to America and settled in New York city, where he engaged in cigar-making. Turning to journalism, he became editor of the "United States Tobacco Journal"; he also invented cigar-making machinery which in some respects revolutionized the industry. 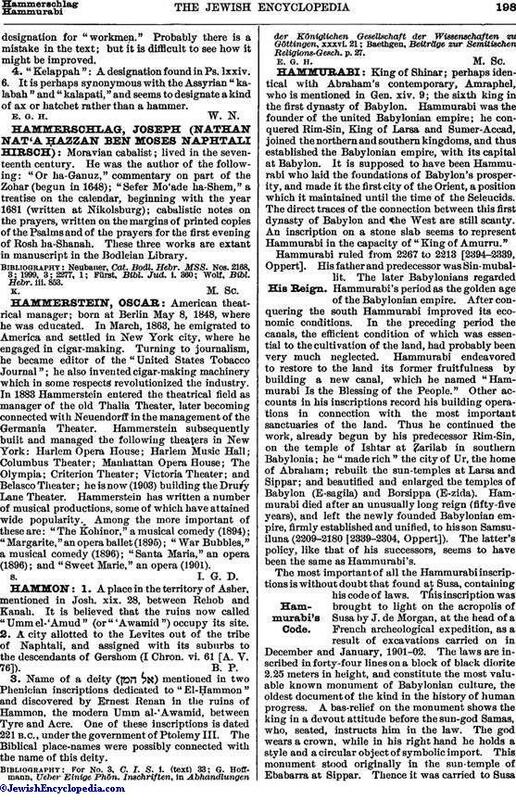 In 1883 Hammerstein entered the theatrical field as manager of the old Thalia Theater, later becoming connected with Neuendorff in the management of the Germania Theater. Hammerstein subsequently built and managed the following theaters in New York: Harlem Opera House; Harlem Music Hall; Columbus Theater; Manhattan Opera House; The Olympia; Criterion Theater; Victoria Theater; and Belasco Theater; he is now (1903) building the Drury Lane Theater. Hammerstein has written a number of musical productions, some of which have attained wide popularity. Among the more important of these are: "The Kohinor," a musical comedy (1894); "Margarite," an opera ballet(1895); "War Bubbles," a musical comedy (1896); "Santa Maria," an opera (1896); and "Sweet Marie," an opera (1901).